Cosmic Dawn came early in the universe's history. The distant galaxy MACS1149-JD1, shown in the insert, appears as it was 13.3 billion years ago, only 500 million years after the Big Bang. 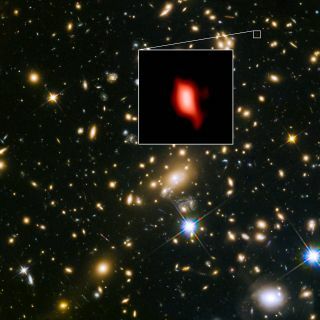 Oxygen distribution detected by ALMA appears in red. Hashimoto and his colleagues have pushed the boundaries of how far back ALMA can look. In 2016, a team led by Akio Inoue at Osaka Sangyo University in Japan used ALMA to find a signal of oxygen emitted 13.1 billion years ago. Only a few months later, Nicolas Laporte of University College London used the telescope to detect oxygen from 100 million years earlier. The two teams combined forces to find oxygen in a galaxy 13.3 billion years ago, roughly 500 million years after the Big Bang. The partnership also turned the VLT toward that ancient galaxy, using the telescope to spot a weaker signal of hydrogen and to verify the distance measured by ALMA. The researchers' new target galaxy is the most distant galaxy ever observed with either instrument and the most distant galaxy for which scientists have a precise distance measurement, Hashimoto said. Because the scientists observed the debris after the stars exploded, rather than the stars themselves, they were able to infer that star formation began before they observed the young galaxy. Using observations from NASA's Hubble and Spitzer space telescopes, the team developed a model of star formation that suggested the first generation of stars emerged within 250 million years after the Big Bang. After the Big Bang, the universe was thick with neutral hydrogen atoms, which do a good job of blocking light. Hydrogen shrouded the early universe for the first 500 million years or so until, eventually, radiation from the first stars split those hydrogen atoms. But the first stars and galaxies have remained a challenge to observe, because they are both faint and few. Astronomers suspect that the first stars started within the first few hundred million years of the universe and that galaxies soon followed, but, according to Hashimoto, researchers still aren't certain of the exact timeline. Did the stars light up individually and gather together as galaxies, or did the galaxies form first, with the stars turning on inside them? Astronomers don't know, but MACS1149-JD1 may help solve the mystery. "Understanding the star-formation history of the universe is very important to understanding the physics of the universe," Hashimoto said. As powerful as they are, ALMA and the VLT would not have been able to find the distant galaxy on their own. They needed to pair with a natural magnifying glass. As light travels through space, it can be bent by the gravity of massive objects in its path. In gravitational lensing, an effect predicted by Albert Einstein, these massive targets magnify more-distant objects, allowing astronomers to catch a glimpse of things their telescopes would not otherwise pick up. By studying the light from the early galaxy as it deflected around an older, more massive galaxy, astronomers were able to peer much farther into the universe than they would have been able to do without that magnification. The team isn't finished with MACS1149-JD1 yet. According to Hashimoto, the researchers are looking for signs of activity in the center of the galaxy that might suggest the presence of a black hole or a young quasar. If they find something, Hashimoto will be "very excited," he said. "That would then give us a hint of the earliest formation of a supermassive black hole in the universe," he said. The research was published in May in the journal Nature. Follow Nola Taylor Redd on Twitter @NolaTRedd or Facebook. Follow us on Twitter at @Spacedotcom and on Facebook.